An ECG, or electrocardiogram, is a simple test that monitors the rhythm and electrical activity of your heart. It is used diagnostically to understand whether you have any problems with your heart, and can be carried out here at our clinic by one of our cardiologists or trained specialists. An ECG is usually suggested if you are experiencing symptoms of a heart problem, such as chest pain (angina), palpitations (where you feel your own heartbeat very strongly), dizziness, and shortness of breath. The ECG test is non-invasive. A specialist will attach sensors (small electrodes which stick on) to your skin, over your chest, arms and legs. These sensors detect the electrical signals sent out by your heart with each heartbeat. They are connected by wires to an ECG recording machine, which reads the signals and produces a graph of your hearts electrical activity. The test only takes a few minutes, and you can return to your normal activities immediately afterwards. The ECG can also be taken whilst you are using a treadmill or exercise bike (stress ECG), or whilst you are going about your daily activities (ambulatory ECG), which allows the heart to be tested under different conditions. The type of ECG recommended will depend on your symptoms, such as if they are triggered by physical activity, or happen more at random. Our experienced specialist cardiologists can carry out these tests in the clinic if appropriate to diagnose the root of any symptoms you are suffering with. We urge you to come and speak to us if you are feeling unwell or would just like the peace of mind of a heart health check-up. Please call us to make an appointment. Why do I need to have an ECG? ECGs are used to monitor and evaluate cardiac symptoms such as chest pain, palpitations, dizziness, and shortness of breath. The doctor will ask you to have an ECG to rule out conditions such as coronary heart disase and arrythmia, or to evaluate your risk of a heart attack. No, there is no pain or discomfort involved. An ECG is a non-invasive test during which electric sensors are stuck onto your chest. These read the signals of your heart and produce a graph. The test takes only a few minutes. 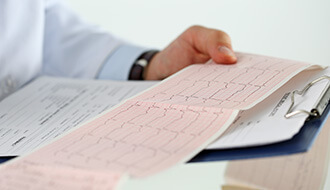 How do I know whether I need an ECG? If you are experiencing any chest pain, palpitations (where you can feel your heart beating strongly in your chest), or dizziness, come in and speak to a doctor who can evaluate you and see if an ECG is necessary. Regular cardiovascular health check-ups are also advised for anyone with a family history of coronary heart disease or heart attack.